All seemed quiet on the frozen ice-world of Nordpole. Nonetheless, Commander Krys Qringul and Expeditionary Light Force (ELF) of the Imperial Guard stood on high alert. 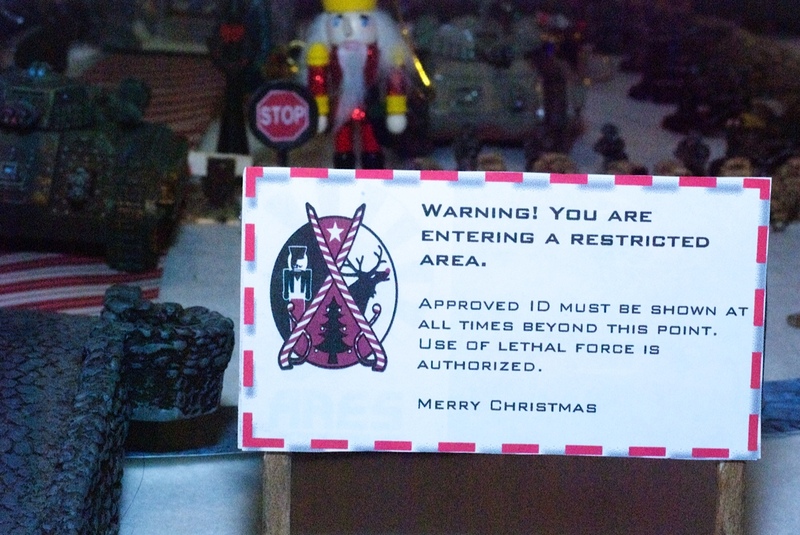 Defending Santa’s workshop was of the highest priority to the Imperium. Two ELF Infantry Platoons (each composed of two Infantry Squads, a lascannon-equipped Heavy Weapons Squad and an autocannon-equipped Heavy Weapons Squad) were deployed around the perimeter on the compound, behind sandbag barricades and razor-sharp tanglewire. They were supported by five Chimeras. Commander Qringul and ELF HQ were deployed within the workshop itself. 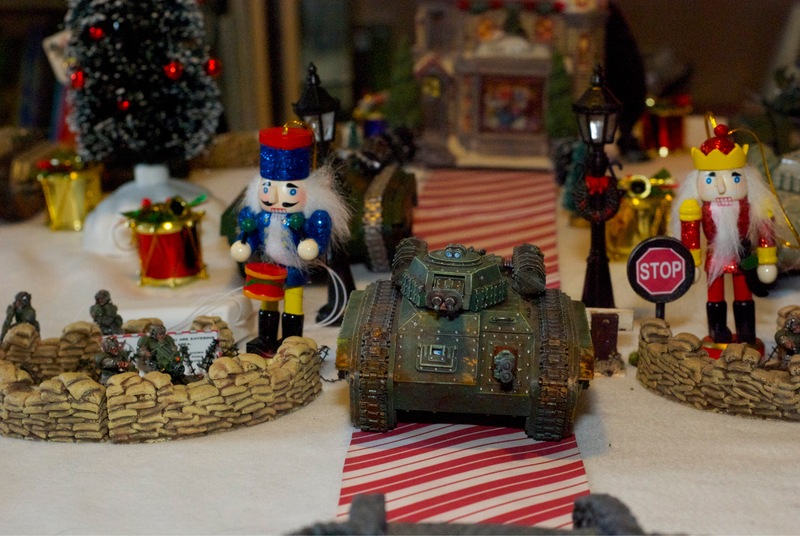 Additional forces from the Retired Extra-Intergalactic Neutralization Divisional Elite Expeditionary Regiment (REINDEER) were also available, with two Space Marine REINDEER Razorbacks located to the rear of the compound, and two Assault Squads in reserve. Several minefields had been laid in key areas beyond the fortifications. 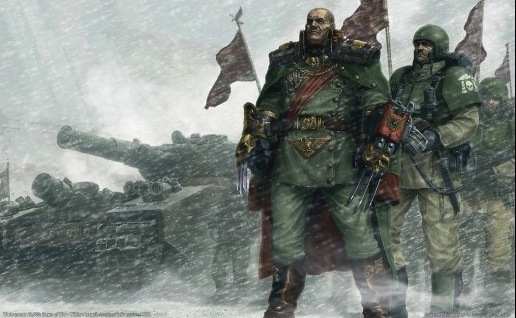 In the event of an assault the defenders of Nordpole could also call upon substantial reserves: an Imperial Guard Vulture and Valkyrie for air support, as well as a Death Company of Captain Rudolph’s Red Raiders (in a Land Raider), two Furioso Dreadnoughts in Drop Pods, and two Land Speeders. In a rare show of cooperation, the three rival attacking Ork hordes all agreed upon a coordinated dawn assault against the complex. Dr Morork deployed to the west, with his fearsome Stompa and his army of rebellious Meks and Grot. In addition to three Grot mobz, his force included four Killa Kans, a Deff Dread, three Lobbas, and a Shokk Attack Gun for added (but unpredictable) firepower. Warboss Da Grinch (and his sidekick Maxx) deployed to the north, with two very large mobz of Boyz, plus Tankbustas, Burnas, and Stormboyz. A group of Kommandos, led by Snikrot, were ordered to outflank and attack Santa’s workshop from the rear if possible. To the east, Warboss Jaakvrozt was ready with his personal retinue of Battlewagon-embarked MegaNobz. His Mechanical Mayhem also included two mobz of ‘Ard Boyz in Trukks, a squadron of Warbuggies (with big shootas), a Wartrakk (with skorcha), two Looted Wagons (one with a skorcha, the other with a boomgun), and four individual Deffkoptas (one with a buzzsaw). 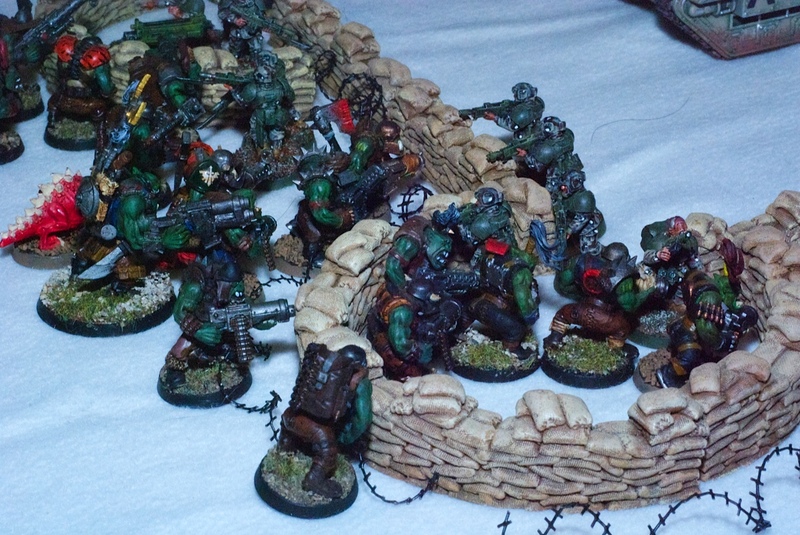 Ork shooting began to slowly whittle down the defenders as the greenskins advanced. A Chimera was destroyed by the Lifta-Droppa on Dr. Morork’s Stompa and wrecked. However, the Tankabustas failed to hit the Chimera parked by the front gate. Unfortunately, this Chimera was equipped with two heavy flamers. It promptly trundled forward and flambéed a good portion of Da Grinch’s forces. While the shoota Boyz carried on, the Stormboyz broke and fled. Next turn the bombsquigs would finally take care it, however. On cue, Space Marine reinforcements arrived to aid the beleaguered garrison. One Drop Pod containing a Furioso Dreadnought was guided by its homing beacon to an impeccable landing right in front of Jaakfrozt’s forces. It promptly assaulted his Battlewagon, destroying it. Jaakfrozt and the MegaNobz assaulted it back, but all of the latter were also destroyed before the Dreadnought was taken down. The rest of the Mechanical Mayhem sped forward to the edge of the Imperial defences, and disembarked. Jaakfrozt himself strode forward as fast as his mechanically-enhanced legs would allow him, hoping to join the action. The guardsman of ELF tried valiantly to stem the tide of Ard Boyz streaming towards them. The would soon be overrun, however. Da Grinch’s Ork Boyz also stormed towards the front gates. Dr. Morork monitored his rival’s progress. Da Grinch led his Boyz up and over the Imperial defences, chopping down the soft squishy pink hummies. The defenders were, again, quickly overwhelmed. Cunningly disguised as tropical palms, the Kommandos achieved complete surprised at the rear of the complex. Santa’s workshop—which had already been heavily damaged by SupaRokkits from the Stompa—was destroyed, and most of the ELF HQ killed. Commander Krys Qringul himself would later be gunned down by Ork sluggas. Inside the compound, things were looking grim for the Imperium. Outside, however, things were looking better as Space Marine reinforcements continued to arrive on the battlefield. A Razorback tankshocked the Grot Lobba battery, breaking it. Later, it repeated the same move on the Mek with the Shokk Attack Gun, killing him. The Valkyrie and Vulture devastated the Grot infantry, and anything else they could find to shoot at. The Valkyrie would eventually be taken down by fire from the Stompa. Landspeeders, Marines, and another Dreadnought destroyed several Kans, and began to converge on the Stompa itself. Dr. Morork desperately recalculated his options as he turned the Stompa to face them. The Death Company and their Land Raider arrived by deepstrike to the northeast of the compound, were they were promptly assaulted by Maxx and a mob of choppa Boyz. The Land Raider was destroyed, but the surviving Death Company soon made short work of the Orks. Moments after they did so, however, a Boomgun found their range. Most were killed in the ensuing blast, while stragglers were picked off by the Warbuggies. The Furioso Dreadnought made a rather sticky green goo out of a Grot mob, Furious, Dr. Morork lifta-dropped it away from his forces, and in the middle of da Grinch’s boyz. The damaged Dreadnought subsequently killed the Ork warboss and his mob before being destroyed by a Tankbusta. Dr. Morork’s Stompa continued to inflict heavy damage on its Imperium, but finally was destroyed by repeated assaults. Loyal Grots managed to escape the burning wreck with Dr. Morork’s consciousness recorded on a holocrystal. Downloaded into another suitable machine, the mad genius would live again! By this point, the sun had begun to slowly set. The few remaining infantry on both sides rushed to the compound, hoping to score a Christmas gift or two. Not trusting Jaakfrozt’s Ard Boyz, da Grinch’s Kommandos assaulted them, but were driven back. They quickly regrouped, then finished off some Space Marine stragglers. Meanwhile, the Burna Boyz realised that they had been having so much fun making snowmorks (or snowgorks) that they had completely forgotten to arrive from reserve. They hurried towards the battle, too late to affect the outcome but not too late to take heavy casualties from the Vulture’s punisher cannons. The Deffkopta’s damaged the Vulture, then proceeded to hunt down the remaining Imperial forces within the complex. Jaakfrozt finally killed something as he stumbled across a lone Space Marine. In the end, of the approximately 250 infantry deployed by the two sides, about a dozen were left alive by nightfall. Jaakfrozt was the only commander to survive. No one managed to claim a Christmas gift, so the game was a tie. Thus the Ork armies retired, to lick their wounds. 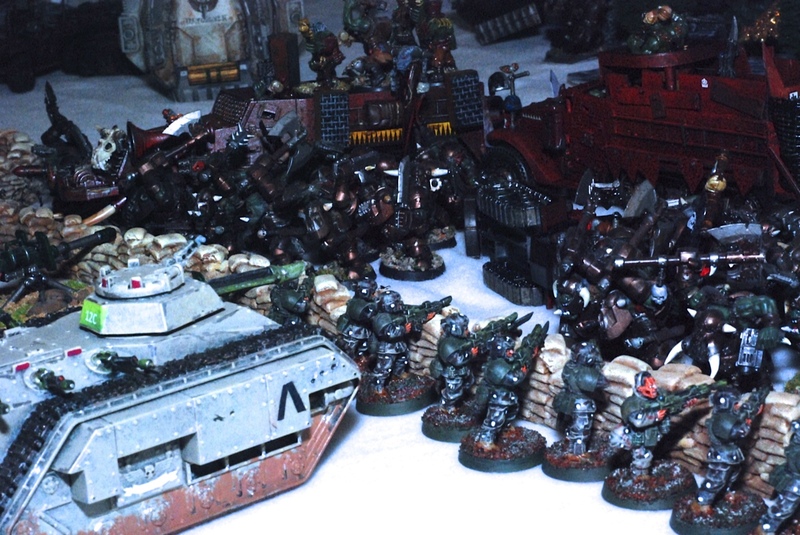 A large Imperial rescue force arrived a week later only to find frozen bodies, the burnt-out remains of Santa’s workshop—and to vow revenge next year, at Orkmas 2013.